My Daily Constitution invites the public to Constitution Happy Hour, a guided, topical conversation about the role of the U.S. Constitution in our shared public life, on Friday, April 20, 2018 from 7:00 pm – 9:00 pm at Paper or Plastik Cafe, located at 5772 Pico Blvd., Los Angeles 90019. SYRIA: JUST ANOTHER UNAUTHORIZED USE OF FORCE? HOW DID WE GET HERE, AND WHAT CAN WE DO ABOUT IT? When President Trump carried out air strikes against Syria last week, he did so without seeking authorization from Congress. This violates both the United Nations Charter, a treaty which the Constitution makes U.S. federal law, as well as the War Powers Clause of the U.S. Constitution, which states that Congress alone has the authority to declare war. But Presidents from both parties have been deploying military force without UN or Congressional authorization since WW2. In this Constitution Happy Hour, Law Professor David Glazier shares insights on why Congress rarely asserts its constitutional power to declare war, the risks that this presents today, and what we can do about it. 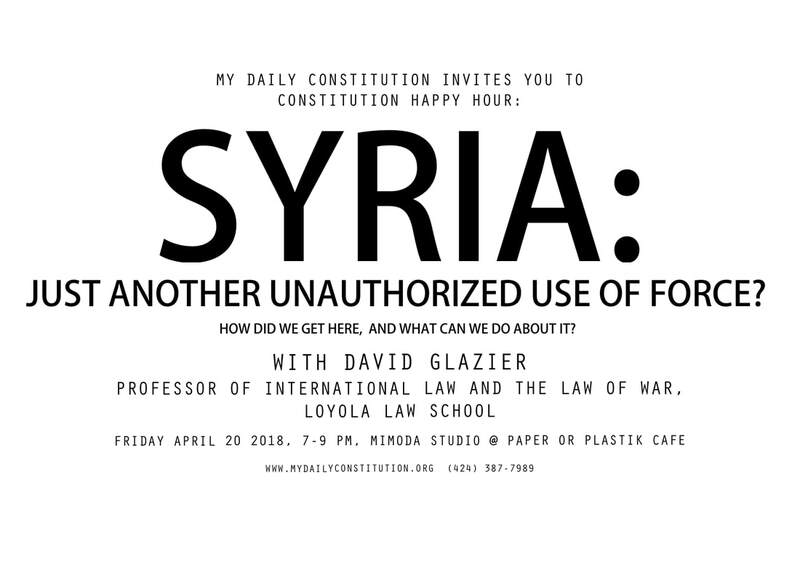 David Glazier is a Professor of International Law and the Law of War at Loyola Law School. Before attending law school Dave served 21 years as a US Navy surface warfare officer. He served in five different ships during his naval career, deploying all around the globe and culminating in command of the guided missile frigate USS George Philip. He also served in a series of political-military affairs billets including tours as the Seventh Fleet staff officer responsible for the US Navy-Japan relationship and the Pacific Fleet officer responsible for the US Navy-PRC relationship. Dave earned his JD from the University of Virginia School of Law where he served on the editorial boards of the Virginia Law Review and the Virginia Journal of International Law. Prior to joining Loyola Law School, Dave was a lecturer at the University of Virginia School of Law and a research fellow at the Center for National Security Law, where he conducted research on national security, military justice and the law of war. He previously earned an MA from Georgetown University in government/national security studies and a BA in history from Amherst College. He was admitted to the Virginia bar in 2004. Optional food, beer and wine available for purchase from the café. Street parking. Complimentary Constitutions will be distributed to attendees. Admission is free, but space is limited. Reserve your seat here. For more information, call My Daily Constitution at (424) 387-7989, or send an email. For more information about this event, call My Daily Constitution at (424) 387-7989.